Berton, Pierre. 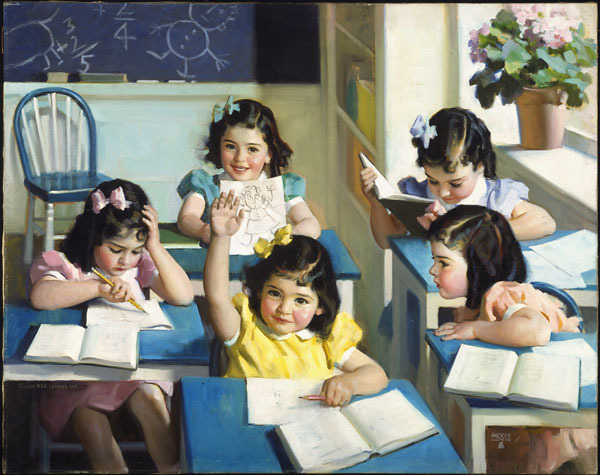 "Dionne Quintuplets". The Canadian Encyclopedia, 05 November 2018, Historica Canada. 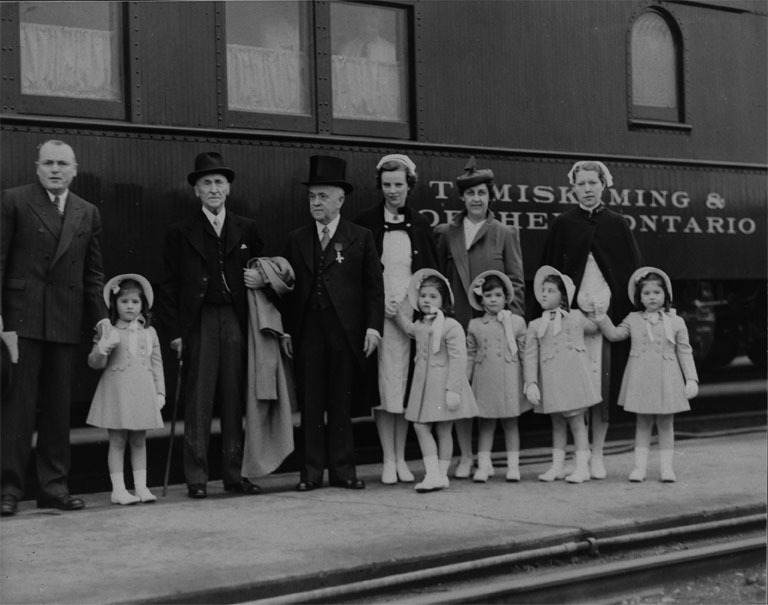 https://www.thecanadianencyclopedia.ca/en/article/dionne-quintuplets. Accessed 18 April 2019. 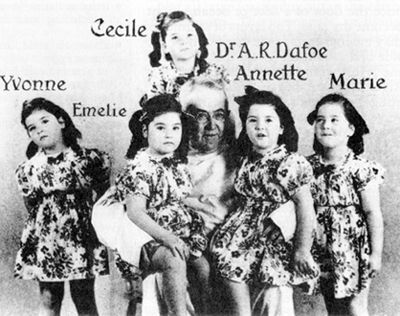 Annette, Emilie, Yvonne, Cecile and Marie aroused worldwide attention after their birth at Corbeil, Ontario, to Oliva and Elzire Dionne on 28 May 1934. With only two previous cases on record, they were the only quintuplets to survive for more than a few days. This miracle, plus their baby cuteness, the poverty of their French Canadian parents, and the controversy over their guardianship, made them the sensation of the 1930s. The Dionne Quintuplets (courtesy Library and Archives Canada). The Dionne Quintuplets with their parents, nurse and guardian, 1939. Credit: Library and Archives Canada/PA-122616. 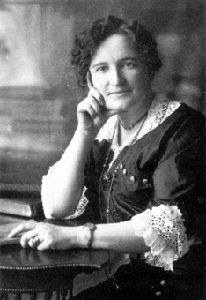 Fearing private exploitation, the Ontario government removed them from their parents and placed them in a specially built hospital under the care of Dr Allan Roy Dafoe, who had delivered them. Oliva Dionne fought a nine-year battle to regain them. In the interval, they became the country's biggest tourist attraction and a $500 million asset to the province. Three million people trekked to "Quintland" to watch the babies at play behind a one-way screen. Hollywood fictionalized their story in three movies in the 1930s. Dozens of commercial endorsements swelled their trust fund to nearly $1 million. A reunion with the family in November 1943 was not successful. Eventually the quintuplets moved to Montréal. Three of the quintuplets — Annette, Cecile and Marie — married but later divorced. 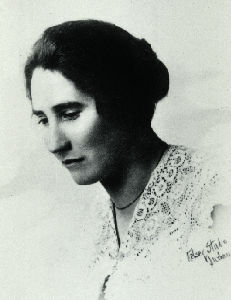 Emilie, an epileptic, entered a convent and died in August 1954 during a seizure. The four survivors told their own often bitter story in We Were Five, published in 1965. Five years later Marie died in February 1970 from what was apparently a blood clot in the brain (the cause of death is uncertain). The remaining three shared the final instalment of the much-depleted trust fund in 1979. In 1997, Annette, Cecile, and Yvonne claimed that their father had sexually abused them in their book Family Secrets: The Dionne Quintuplets’ Own Story, co-authored by Jean-Yves Soucy. In March 1998, the Ontario government announced that it would pay the three surviving quints $4 million in compensation for the nine years they spent on display at a tourist theme park. Three years later Yvonne died of cancer. Not until September 1987 was another set of quints — this time two boys and three girls — born in Canada. James Brough, Annette Dionne, Cecile Dionne, Marie Dionne and Yvonne Dionne, We Were Five: The Dionne Quintuplets’ Story from Birth through Girlhood to Womanhood (1965). Pierre Berton, The Dionne Years: A Thirties Melodrama (1977). Jean-Yves Soucy, Annette Dionne, Cecile Dionne and Yvonne Dionne, Family Secrets: The Dionne Quintuplets’ Own Story (1997). Ellie Tesher, The Dionnes (1999). Paul Talbot, The Films of the Dionne Quintuplets (2007). Reunion (1936), directed by Norman Tourgog. Fictionalized account starring the quintuplets. The Country Doctor (1936), directed by Henry King. Fictionalized account starring the quintuplets. Five of a Kind (1938), directed by Herbert Leeds. Fictionalized account starring the quintuplets. Five Times Five (1939), directed by Frank Donovan. Documentary. Million Dollar Babies: The Shocking Story of the Dionne Quintuplets (1994). Directed by Christian Duguay. Fictionalized account. Full Circle: The Untold Story of the Dionne Quintuplets (1998), directed by Maya Gallus. Documentary. The Dionnne Quints museum features digitalized images and documents that tell the story of the famous Dionne Quintuplets. Callander Bay Heritage MuseumLocated in the former home and practice of Dr. Allan Roy Dafoe, physician to the Dionne Quintuplets, this museum features images, artefacts and documents related to his life and the story of the world’s most famous babies. Le musée des jumelles DionneLe musée des jumelles Dionne présente des photos et des documents numérisés qui racontent l'histoire des célèbres quintuplées Dionne.